Ah yes, the banter of the clubhouse. 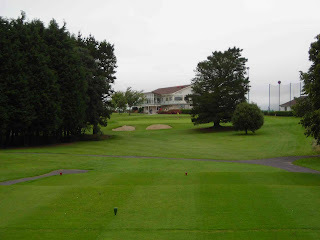 I had just finished a round of golf with the two boys on the old, mature and rather classic parkland that is Dundalk Golf Club. Long, tree-lined, up and down and very enjoyable. It’s funny how you meet people who have an instant reaction to who you are. Bill was very interested in the book because his wife writes a lot of articles on golf destinations for various newspapers and magazines. Which is exactly what I want to do when I finish this book. It wasn’t exactly what you call a good round. I had a N/R – having lost three golf balls in the first eight holes – and when Bill found one and donated it on the 8th I was too embarrassed to lose it. Here’s me playing off 7 and Bill is a mid-teen handicapper who plays a few times a year. I tried to catch up with Leslie Walker, the pro. We have history, having gone to the same school in Dublin and played on The High School golf team in the Leinster School Boys Cup. The competition is a two pair, fourball better ball matchplay event. Every score counts, so even if you’re 13 up you keep going. 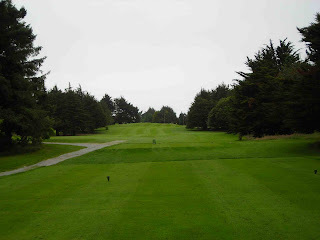 On a day I will never forget we played Malahide in the semi-finals, on Malahide’s old golf course. Alan and I were 1 up playing the 17th and Leslie was behind and in complete control of their match. I had a six inch putt to win the whole thing and ended up on the side of the green waiting for the opposition to finish. I knocked the ball back and forth impatiently and got penalised for testing the speed of the green. We ended up losing the entire match. Malahide then went on and lost in the final at which point we discovered that the opponent who called the penalty on me had left Malahide the year before and was therefore ineligible to play. Salt in the wound you might say. It didn’t stop Leslie’s impressive rise into the PGA ranks, but I was a broken man with shattered dreams. I have never recovered.